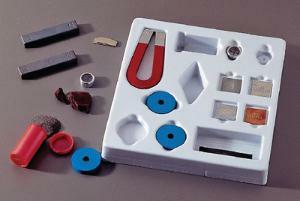 The Economy Magnet Kit showcases the basics of magnetism. The kit features one horseshoe magnet, two ceramic bar magnets, three ceramic donut magnets, iron filings, a lodestone, and two compasses. It also includes one square each of iron, copper, aluminum, and zinc.